Emerald Tires is located in Virginia, where there is an annual state inspection requirement for every vehicle registered in the state. Virginia state inspections are the most regulated inspections in the U.S. Measuring tire depth is a requirement in the inspection process. All of our tires are guaranteed to pass Virginia State Inspection. We only sell the highest grade of tires. In light of the economy for the past few years and the rising cost of new tires, the demand for quality used tires has greatly increased. 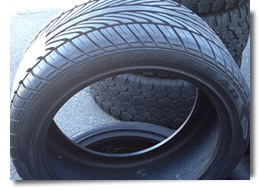 Emerald Tires has an enormous selection of quality used tires at an affordable price. We carry passenger vehicles, crossover vehicle, pick-up trucks, SUV, off road, trailer and specialty tires.